The British-designed Sherman ARV Mk II incorporated a Croft 60-ton winch in the fighting compartment, a detachable 3.5-ton winch at the front and a fixed 9.5-ton winch at the rear. There was also a substantial earth anchor and a fixed ‘turret’ in which was installed a dummy gun. The most effective Sherman-based anti-mine device was the chain flail, consisting of a large cylinder carried ahead of the tank to which were attached a series of chains. In this photograph the side covers of the flail have been removed to show the chain drive. Entering service in 1944, the M32B1 was also converted into a prime mover for heavy artillery by the removal of the A-frame; in this form it was designated ‘full track prime mover M34’. The British Army also used the M32 recovery vehicle, describing it as the ‘armoured recovery vehicle (ARV) Mk III’, but the workshops of the Royal Electrical and Mechanical Engineers (REME) also constructed a ‘British’ Sherman-based recovery vehicle that they designated ‘ARV Mk II’. The vehicle incorporated three winches – a Croft 60-ton winch installed in the fighting compartment, a detachable 3.5-ton winch at the front, and a fixed 9.5-ton winch at the rear; there was also a substantial earth anchor designed to hold the vehicle in place during heavy ‘pulls’. In order to camouflage the significance of the vehicle, there was also a fixed ‘turret’ in which was installed a dummy gun. REME also developed a more specialised vehicle for recovering drowned or disabled tanks, or other vehicles, from the D-Day landing beaches. Based on the hull of a Sherman from which the turret and gun had been removed, the so-called beach armoured recovery vehicle (BARV) had the hull sides extended in height by the addition of face-hardened armoured plate. Although the driver was reliant on instructions from the commander, the vehicle was able to wade in up to 8ft of water without being swamped. A wooden pusher pad on the nose minimised the possibility of damage when soft-skinned vehicles were being recovered. Equally well known for their role on the D-Day beaches are the so-called ‘duplex-drive’ (DD) amphibious tanks. Surprisingly, the British Army had actually started to test amphibious tanks during the First World War, but development did not reach a stage where the vehicles were considered to be reliable. It wasn’t until June 1941 that the Hungarian inventor Nicholas Straussler finally solved the problem of making tanks float by the simple expedient of fitting a folding heavy canvas screen to a frame welded around the top of the hull. With the tank in the water, this increased the displacement of the hull to the point where the tank was able to float with the hull below the waterline. Compressed air was used to raise the screen, and it was held in place by mechanical stays. A second drive system transferred power from the track drive sprockets to rear-mounted propellers, and steering was achieved by means of a rudder, and by rotating the propeller mountings in a horizontal plane. Much impressed by Straussler’s folding screen, Major General Percy Hobart of the British 79th Armoured Division carried out swimming trials in Portsmouth harbour, and the success of these trials led to the selection of the British Valentine for the development of the duplex-drive tank. At the same time plans were also put in hand to convert Shermans for the role. Although most of the American, British and Canadian DD tank crews did their preliminary training using Valentines, it quickly became apparent that the Sherman was more suitable for amphibious use and both M4A2 and M4A4 variants were modified. The drive to the propellers was taken from the rear sprockets using bevel gears, which meant that the tracks were running as soon as the tank touched the beach, and the propellers were designed to hinge upwards when not in use. The height of the canvas screen was also increased when compared to the Valentine. DD Shermans were used, with some patchy success, on D-Day, as well as during the Rhine crossing in 1945. Shermans were also successfully adapted to carry the much-feared flamethrower weapon. Back in 1940 the British company Lagonda Motors had constructed and demonstrated a portable flame-thrower device that could project burning petroleum-based fuel a distance of 100ft, and eventually managed to extend this range to around 350ft. It was initially imagined that the weapon could be used for the protection of shipping and airfields against low-level attack by aircraft, but neither the Royal Navy nor the Royal Air Force showed much interest and further development concentrated on mounting the flame-thrower on either a truck or a tracked vehicle. In this form the British Petroleum Warfare Department (PWD) hoped that the weapon would prove to be effective against pillboxes and strong points. By the end of July 1942 the flame-thrower had been successfully adapted to allow it to be fitted to a tank, and versions were produced using both the Valentine and the Churchill, the latter carrying the flame-thrower fuel in a trailer. 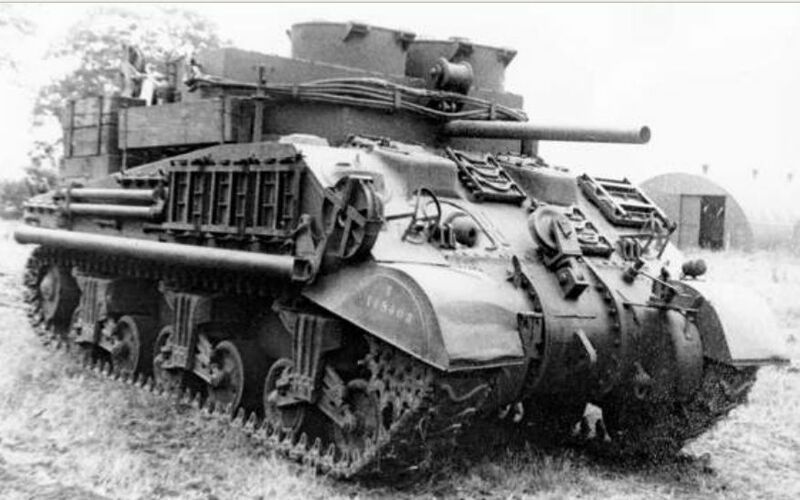 Known as the Churchill Crocodile, this version was selected for production, but the British and Canadian Armies also produced experimental Sherman flame-throwers under the names Ronson, Salamander and Adder. 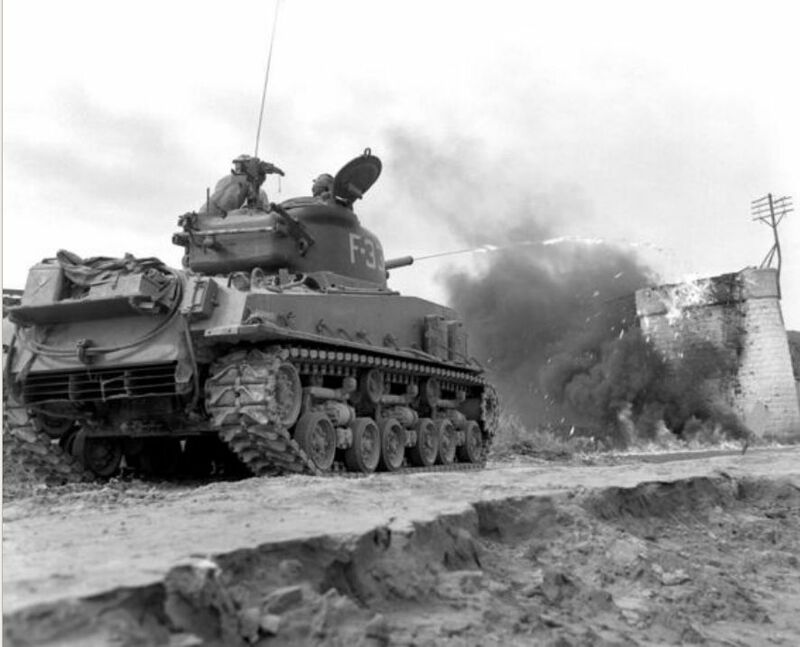 The US Army similarly produced flame-thrower devices that could be mounted on the Sherman. In some cases the flame projector was fitted into the co-driver’s periscope aperture or the hull machine-gun position, while in other cases it replaced the main gun. In late 1944 the US 2nd Armored Division also adapted four Shermans to mount the Churchill Crocodile flame-thrower. Another role in which the Sherman was hugely successful was that of mine clearance. Large numbers of anti-tank mines were laid by the opposing armies, and in addition thousands of anti-personnel or land mines also presented considerable danger to the advancing armies. Various solutions to the problem of dealing with these mines were proposed, including explosive devices, flails, rollers and ploughs, all of them designed to be attached to modified tank hulls. Many were immediately dismissed as being impractical, but others were developed to the point where they were quite successful. Of these, the flail proved to be the most effective. Work on a mine flail had started in 1939 when the British Mechanization Board had proposed that anti-tank mines could be exploded in situ by means of weights attached to the ends of spring-steel strips; the strips were attached to a revolving drum carried ahead of a tank. It was quickly found that the device was more effective if the spring-steel strips and weights were replaced by revolving chains, and initial trials of what was described as the Baron Mk I were carried out with a Matilda II tank. This was followed by the Baron Mk II, which was equipped with a hydraulic raising and lowering system for the rotor. During 1942 a simpler flail device, dubbed Scorpion, was developed in the Middle East, and by the end of July 1943 Scorpion had been issued for user trials, before being abandoned. However, during the previous month there had been considerable progress with mounting a modified version of the Scorpion on a Sherman tank, and this became the most successful of the flails. Designated Crab, the first prototype was ready for trials in September 1943 and the system proved to be very effective at destroying mines and cutting barbed wire. Other approaches to the problem of mine clearance included explosive devices, ploughs and rollers. The Sherman Snake and Conger were both explosive devices and consisted of a long hosepipe or cylinder of explosive material that was intended to be pushed across a minefield and detonated remotely, thus exploding the mines ahead of the advancing tank. A similar device, dubbed Tapeworm, consisted of a flexible hosepipe that was designed to be towed across the minefield by a flail tank; once in position, it was filled with liquid explosive and detonated. Tank-mounted ploughs designed to expose anti-tank mines were developed before the Second World War by agricultural engineers John Fowler & Company, but despite considerable work the device never lived up to its original promise. The British 79th Armoured Division developed a version of the plough, dubbed Bullshorn, testing it in conjunction with a Sherman. It was eventually abandoned in favour of the flail, but a few Bullshorns were useful on D-Day for filling in craters caused by exploding mines. Anti-mine rollers had been developed in the years immediately following the end of the First World War, and were designed to detonate mines by simulating the weight of a tank rolling over the fuze. By 1937 John Fowler & Company had successfully trialled an anti-mine roller attachment (AMRA) consisting of a girder frame that was effectively pushed ahead of a tank, and which carried four heavy rollers. This idea was adapted to produce the Sherman-mounted anti-mine reconnaissance castor roller (AMRCR), which proved useful against anti-personnel mines. 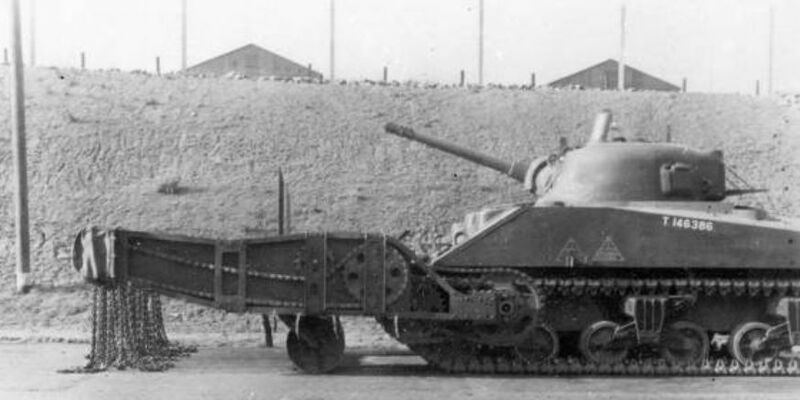 Spiked rollers were also tested experimentally in the Middle East, and one such device, dubbed Porcupine, was trialled in Britain in conjunction with a Sherman. The most successful anti-mine roller was the Canadian indestructible roller device (CIRD). Constructed at the Canadian Army Workshops at Borden during 1943, the CIRD consisted of two rollers of solid forged armour-quality steel, 16in wide and with a diameter of 26in, each weighing around a ton. The rollers were carried on trailing arms suspended on a substantial cross-shaft, arranged to pivot some distance ahead of the tank in front of each track. Helical springs were provided to hold the trailing arms in the operating position. The CIRD was standardised for use with both the Sherman and the Churchill in May 1945, although further development of roller devices was eventually abandoned in favour of the more successful flail. Nevertheless, other roller devices such as Rodent, Aunt Jemima, Earthworm, Centipede and Lulu all achieved some degree of success. The last named brought a little more technology to the problem by adapting the successful Polish electro-magnetic mine-detection system for use with a tank. Finally the remote ‘mine roller T10’ replaced the track system of the Sherman with three huge rollers mounted tricycle fashion on swing arms. The Sherman was also used, at least by the US Army, as a rocket-launcher mount. Various systems were developed, but only two – the ‘T34 Calliope’ and ‘T40 Whizbang’ – saw combat use. 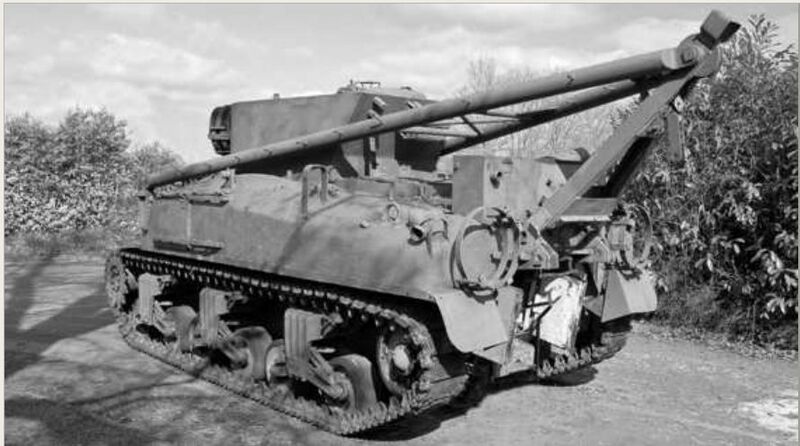 Dating from 1943 and used by the US 2nd Armored Division in France in 1944, Calliope consisted of sixty 4.6in rocket tubes mounted in a frame above the turret; the mount could rotate with the turret and the tubes were elevated by a mechanical link to the gun barrel. Whizbang was also used in combat in 1944/45, and consisted of twenty 7.2in rockets in a hydraulically elevated box mount. Consideration was also given to adapting the Sherman to provide what the British would have described as an assault vehicle or ‘armoured engineers’ vehicle’, and in April of 1945 a prototype was produced for the ‘demolition tank T31’. The vehicle was constructed on an M4A3 chassis with the horizontal volute spring suspension (HVSS) system; the thickness of the floor was increased to 1.5in and both a flame projector and a ’dozer blade were fitted. The massive turret mounted a 105mm howitzer, with a 7.2in T94 rocket-launcher to either side; the rocket launcher incorporated a revolving feed mechanism that held five rounds, and reloading could be carried out from inside the hull. A single prototype, with a dummy 105mm gun, was delivered to Aberdeen Proving Ground in August 1945, but the project did not extend beyond the prototype stage and was subsequently cancelled. Lastly, mention must be made of the inflatable canvas and rubber ‘Shermans’ that were deployed in 1943/44 as part of ‘Operation Fortitude’ – the deception plan that fooled the Germans into thinking that the invasion would come from Kent into the Pas de Calais region of France. All kinds of tactics were used, including dummy tanks and aircraft, fake radio traffic, and even the recorded sound of heavy trucks apparently moving around dummy marshalling areas. Comprising four separately inflated chambers, the dummy ‘Shermans’ were given realistic markings, as well as having nuts and bolts and other detail painted onto the canvas. Once inflated, the dummy ‘tanks’ were lined up in rows and covered with camouflage netting. Inflatable ‘Shermans’ were also used during ‘Operation Shingle’ at Anzio, in an attempt to confuse the enemy regarding the real location of Allied tanks. In Argentina there are still a few british Sherman anti mine M-4 Sherman (retired) del RC Tan 12 con roller Urdan Industries Ltd mine RKM army. in Argentina there are still some british M-4 Sherman (retired) from Tan RC 12 with roller Urdan Industries Ltd mine RKM army.